The monthly ArtSmart Roundtable brings together some of the best art-focused travel blogs to post on a common theme. This month we are treating you to An Art Day in some of our favorite city. Check out all the stories below! I am so lucky to live in Washington DC! We have interesting architecture, great music and performing arts organizations, very active international Embassies, beautiful public art and monuments, and an incredible collection of museums and galleries. Since the National Gallery of Art and Smithsonian Museums are administered by the US federal government, admission is always free. While this is a dream come true for DC’s students, it is great symbolic gesture for visitors to the city – the visual arts should be enjoyed freely and shared with all. With all the special exhibits to see, I practically get an “art day” every month and so I absolutely recommend an art trip to DC! The National Gallery of Art located along the National Mall is largely the product of industrialist banker Andrew W. Mellon. His collection and vision was the basis of a new American museum of Old World Master paintings. Through an Act of Congress in 1937, construction began on the new Museum, but it was Andrew Mellon’s example of generosity that led other wealthy American collectors to donate their incredible works to the new museum. The East Wing filled with Modern Art was designed by I. M. Pei and was completed in 1978. “Ginevra de’ Benci” (Photo) in the only painting by Leonardo da Vinci in North America and a definite “must-see” at the National Gallery of Art in DC. The National Gallery has undergone stages of renovation over the last 10 years to update the galleries. Lighting, wall paper and trim has been thoughtfully selected to best present the works. For example, the Rembrandts in the Dutch galleries are hung in wood paneled rooms resembling a home where they might have been originally viewed. 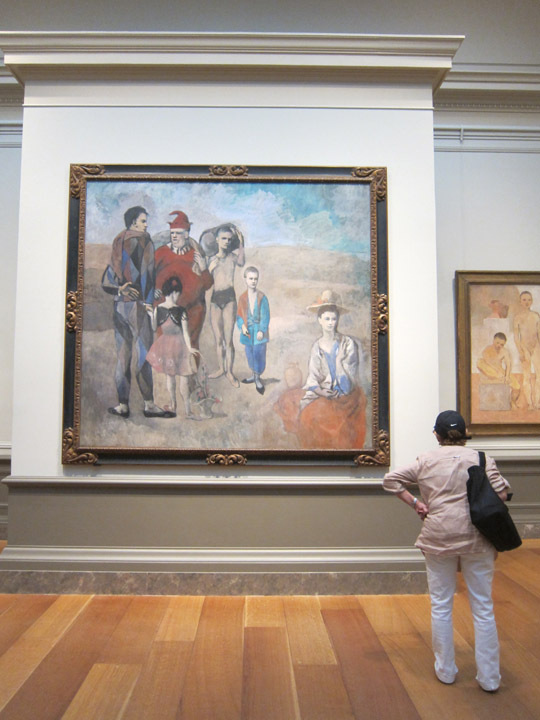 The National Gallery does rotate its collection some so paintings may be moved from one visit to the next, but you will always be able to find its most famous pieces on display. Every time I stop by the NGA, I have to visit Leonardo da Vinci’s Ginevra de’ Benci. I have yet to find a brush stroke on her glowing face which demonstrates Da Vinci’s amazing skill with layering skin tone pigments in glazes. I also always stop to see Jan Van Eyck’s The Annunciation which is a jewel box of intricate detail and color. This piece had been badly damaged and the art conservators at the NGA are so good you really can’t tell even under the closest scrutiny. The early Italian rooms have some beautiful pieces by Giotto and Duccio. I’ve always like the “The Calling of the Apostles Peter and Andrew” from the Maesta altarpiece in Sienna. 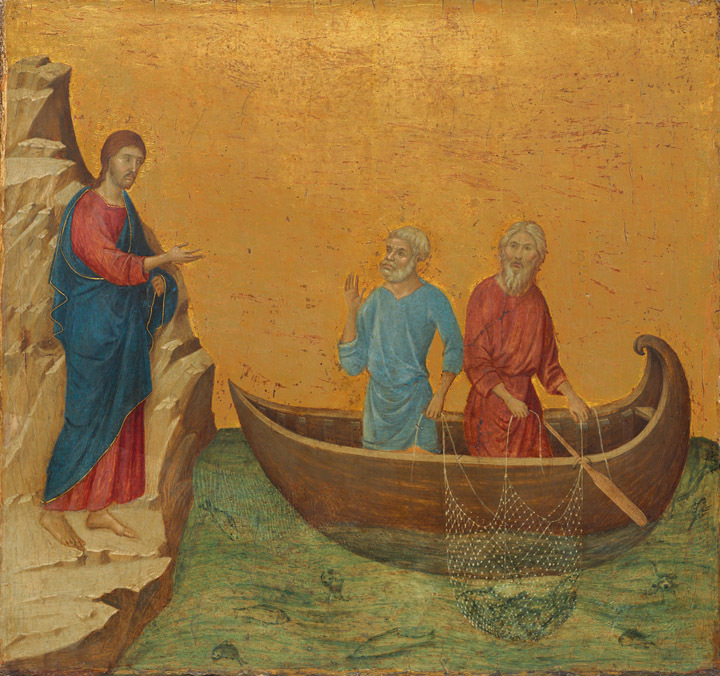 The intense gold background reminiscent of icon paining is off-set by a delicately painted, almost-naturalistic ocean filled with several species of fish. Even in this little panel, I see the coming of Renaissance Art. The NGA continues to receive amazing gifts which further enhance the collection. In 2013, Mr. and Mrs. Paul Mellon bequest Vincent van Gogh’s “Green Wheat Fields, Auvers, 1890” and other paintings which are still arriving. With its thick impasto and swirling foliage; this has quickly become one of my favorite paintings at the NGA! 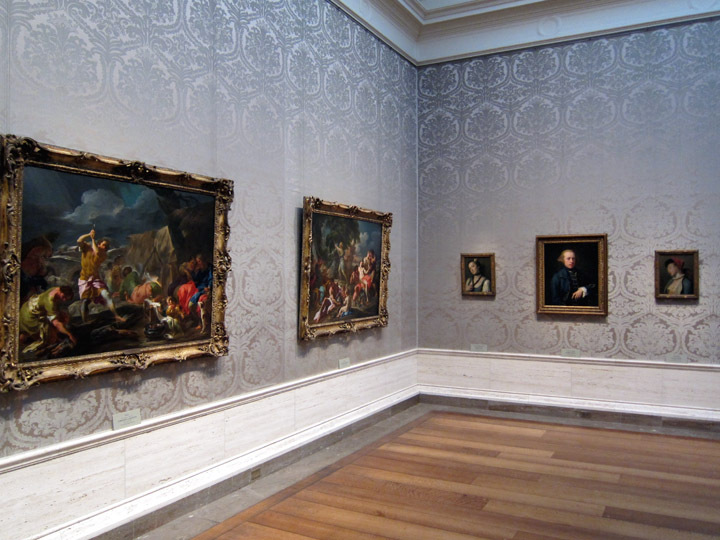 If you are pressed for time or exahusted by museum, check out the NGA’s self-guided tour list. These helpful guides point out the highlights of the collection and take about an hour to complete. Maybe one of the hidden gems in Washington DC is the Peakcock Room at the Freer and Sackler Galleries of Asian Art. This room was designed and decorated by James McNeill Whistler for wealthy Londoner Frederick R. Leyland in 1877. The space was created to show off the owner’s impressive collection of Eastern porcelain along with Whistler’s painting “La Princesse du Pays de la Porcelaine” as the room’s centerpiece. Whistler spent 8 months completing the room and fell into a bitter disagreement with Leyland over his payment. After offering only 1000 pounds for the work (which Whistler claimed was only enough to cover the window screens), Whistler painted a biting mural of two peacocks fighting over silver coins on the back wall of the room. Once he completed the Peacock Room, Whistler never saw it again. While Leyland may have been upset about the rampant costs associated with finishing the room, he never changed anything and space remains as Whistler intended. American Charles Lang Freer admired Whistler’s work and loved the Peacock Room. He purchased it in 1904 after Leyland‘s death and had it dismantled and shipped to his home in Detroit. 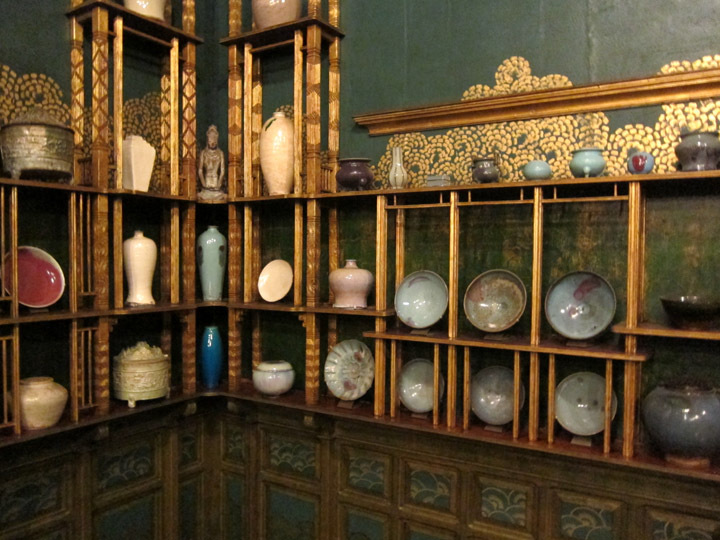 After Freer’s passing in 1919, the room was re-installed at the newly created Freer Gallery of Art which houses his collection of Asian art that had been donated to the US. Today curators at the Freer have selected pieces of pottery similar to Leyland‘s collection so that the Peacock Room can be viewed as originally designed. The Peacock Room is a fantastic piece of design. The completeness of the artistic vision creates an encompassing and unique space. For an extra treat, the shutters are opened for the afternoon on the third Thursday of the month so you can see the room in breath-taking natural sunlight. Of course with the National Portrait Gallery, Smithsonian American Art Museum, Hirshhorn Museum and Sculpture Garden and all the amazing monuments, there is so much art to see in DC! You may need to have a few art days when you visit!